The ongoing saga of my staircase is (almost) over. 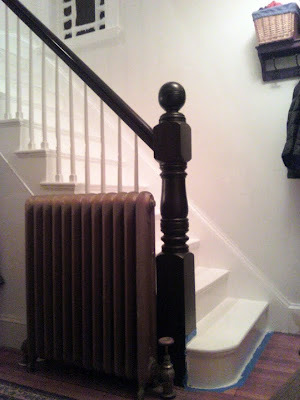 Just under a year ago, I posted a detailed account of the installation of a new custom-made newel post. Make sure to check it out for reference photos. Soon after that, I stained and varnished it, but made some mistakes in the finish that needed to be fixed. And there it sat until this weekend. The staining and varnishing went off without a hitch. I then added to my project when I realized that I should strip and repaint the trim on the stained glass window in the stairwell. This led to getting out a ladder and reglazing one of the panes that nearly popped out while scraping the flaked paint. Sigh. The curved stair was quite a project. Contrary to popular belief, inch-thick pine boards don't bend easily. To make the curved riser, I had to use the table saw to painstakingly cut 30+ kerfs in the back of the board which allow it to bend. 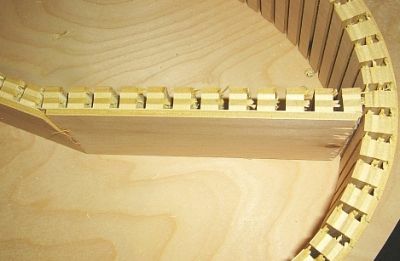 To make the curve on the tread, I just used a jigsaw, but then had to buy a new router bit to match the bullnose profile of the rest of the tread. And finally, I needed curved 5/8" x 3/4" cove molding for under the overhang of the tread. I called all over eastern MA to find someone that carried flexible molding, but no one did. I tried cutting kerfs in pine molding like I used on the other stairs, but because of the cove profile I couldn't take off enough material to make it flexible. Thus, I had to custom make my own cove molding from a 1" x 10". I cut out the outer edge of the curve with the jigsaw, bought a cove bit for the router, cut the cove profile, and then jigsawed out the inside edge. I popped it on and it fit perfectly! All told, the molding was much easier than I anticipated. One thing I learned this weekend is that painting balusters is a royal pain. If I never have to do it again it will be too soon. I'm glad I looked up tips for doing it, though. The tip I read said that using a paint brush is a bad way to go--it takes forever and the results aren't good--and instead one should use a painting pad. I just happened to have an old one that I cut in half, and it really did work quite well. The last phase of the project--one which I will have to do in the next week--is installing a carpet runner on the stairs. The high gloss paint is rather slippery for man and dog alike, so this one can't wait a year. Looks nice! You have waaaaaay more patience than I do when it comes to these kinds of home improvement projects. I'm a eh-it-looks-all-right kinda gal. Do you have a runner picked out? What color will it be? Jenn told me about this project, and I am SO impressed. It looks fabulous. By the way, I cannot believe that you raised half of your house up by yourself. That one act alone should put you in the category of the Greek heroes and ensure your place in Elysium. Thanks, Jenn. We haven't picked out a runner yet. What I'd like is a nice, plush, deep red oriental pattern with high-quality stair rods. What we can afford is basically the cheapest thing we can find. The only thing to look for is -- and it's not a deal breaker if the price is right -- that the color is dark enough to hide lots of dirt. Kelly, thank you too. But before you place me in league with ancient heroes, I must fess up: I didn't raise up the house with my own hands. I used a 20-ton bottle jack and some lally columns. Sorry to have to break it to you this way, but I just felt bad with you thinking I lifted up my house that way. I could see your patience brought you a wonderful result. It's pretty admirable for someone who decided to do all this kind of stuff himself, while others would just call for some aiding services. Good job to getting the job done! It looks so elegant and classy. Wow, I don't think I can do all these by myself, seriously.